My dad and I used to have great fun playing around with words. The word herb was a particular favourite, and we laughed hysterically in the car, yelling ‘Herb’, ‘Erb’, and ‘Hoib’! These special little moments linger with me to this day. I still giggle just thinking about these silly exchanges. Many herbs – both fresh and dried – provide an abundance of nutrients. Adding herbs to salads, smoothies, sauces, meats and fish can not only increase the flavor component of the dish (think cilantro, parsley, rosemary, mint, basil, thyme, sage, dill, and oregano, for example), but they can up the nutrient value substantially. Health benefits increase exponentially by adding fresh herbs at the end of a cooked dish, or better yet, by eating them fresh for full-on nutritious potency. My new favourite herb, basil, has an anise- and clove-like flavor, and the two most common types in our neck of the woods are sweet and Asian. Basil is a highly-prized herb with incredible medicinal properties, and is easy to maintain, both indoors and outside. What does beautiful, bountiful basil do for us, aside from packing a flavor punch? For starters, it is impressively high in vitamin K, which is essential for blood-clotting. It is also chock-full of vitamin A, a powerful nutrient essential for vision and protecting and maintaining healthy mucus membranes and skin. It presents anti-bacterial and anti-inflammatory properties, found especially in its healthful essential oils, helping to restrict the growth of harmful bacteria. And it is a great source of iron. I make a wonderful basil dressing for salads that just about makes me swoon. Have a peek below for the recipe. 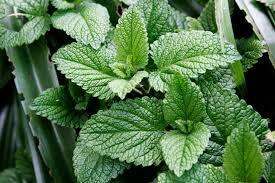 My other new favourite herb, mint, is finding its way into my smoothies these days. Pair it with fresh lime juice in smoothies…oh yum. Check out this smoothie recipe for a wonderful use of mint. So, what does this familiar herb do for us? In addition to the obvious breath-freshening capacity of mint leaves, this herb also graces us with its remarkable medicinal properties. For starters, mint is wonderful for calming the stomach. It offers an anti-spasmodic effect on smooth muscles, and clarifies the blood. Like basil, mint is high in vitamin A. From a digestive perspective, mint stimulates saliva glands, thereby producing digestive enzymes to help break down and absorb the food you ingest. Even just smelling mint leaves or its oil acts as a terrific remedy for nausea, headaches, and respiratory woes (by opening the nose, throat and lungs). Sniffing mint can actually release a small amount of serotonin, affecting brain function and thus helping alleviate depression and fatigue. Mint’s anti-bacterial and anti-inflammatory properties are great for oral health, help to fight acne, and bring a glow to the skin. I’ve had a love affair with fresh parsley for many years. It has come a long way from it’s woeful, common culinary beginnings as a sad, droopy snippet at the side of a restaurant dinner plate. What does parsley bring to the plate these days? 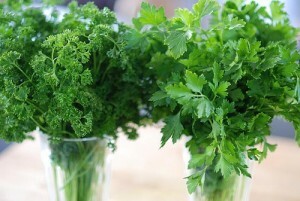 Parsley is a potent immune-booster, helpful in the fight against allergies. It provides major anti-inflammatory properties – especially notable is eugenol, found in parsley oil, and particularly terrific for people with arthritis. Parsley contains B-vitamin folic acid, which helps to lower the risk of stroke and heart attack. I use it for its beneficial detoxifying properties, notably boosting liver enzymes to aid in clearing out bodily toxins. Like mint, parsley brings anti-bacterial properties that help keep breath fresh. Hence, back in the day, the sprig at the side of your plate was placed there as your green ‘after-dinner’ breath freshener. Add parsley to smoothies, soups, and salads. Make a refreshing salsa with loads of parsley. Try both curly- and flat-leafed (Italian) parsley. Spring is around the corner. Why not start a few pots of herbs, either on your window sill or out on the patio, to enhance your meals and to bring you incredible nutritional goodness. Blend all ingredients together until smooth. This dressing is best served fresh. Note: I must say – the utter deliciousness of this dressing really surprised me. I think that the next time I make it, I will slightly decrease the water content as I’m a sucker for thick, creamy dressings. Thin or thick, the flavor of this (very green) sauce is supoib!